It was nice to hear from so many people about the chaos in their lives. Seems there is an abundance of chaos and many are working to restore order to their lives. While at the rock show last month where I bought the Labradorite, I also added several slabs of Clinochlore, also known as Seraphinite, to my collection of healing stones. Generally, I understood it to be an angelic healing energy more powerful than malachite, my stone of preference for healing work. One of the difficulties I’ve had with using seraphinite has been its strong and high frequency often is unable to find resonance with the person receiving the healing. Either they fall asleep or get quite groggy or numb out. All good in some circumstances, but not so good in others. Since buying the slabs, I slipped several 3" by 6" between the mattress and box spring my our bed. Chuckle. Wonder what will come of that....smile. Since reversing my line of sight from down and inward to up and outward, each day has moments of plain and simple happiness. Life is good. PS. Several people have asked if I still do healing work. I have been doing fairly regular sessions for the last several months. 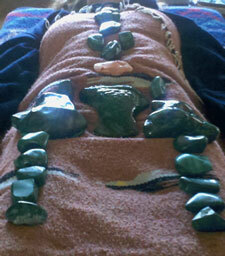 Here’s a photo of a recent session of deep emotional and physical healing using malachite. I am excited to offer a completely new workshop on creating and using shamaic tools. Details are below. Seraphinite is a lovely dark-green stone that changes sparkle and light as you view it from different positions. It comes from the Korshunovskaia mine which is situated not far from Baikal Lake in Eastern Siberia, Russia. Its hardness is 2 – 2,5 (Moh’s Scale), density 2,6. 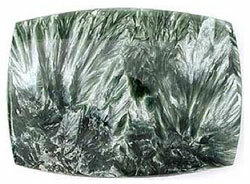 Seraphinite is the trade name for gem quality CLINOCHLORE of the Chlorite Group. Its Chemical formula H Mg5 Al2 Si3 O18. Clinochlore was found and described by the famous Russian mineralogist Nikolai I. Koksharov (1818 – 1892) who was once the director of the Imperial Mineralogical Society. This mineral got its name from the Greek words for inclined and green since its structure is monoclinic and its common color is green. Seraphinite apparently acquired its name due to its resemblance to feathers, such as one might find on a angel's wing. The word Seraph is from Isaiah 6 in the Hebrew Testament, and refers to winged angelic beings in service of God. Melody informs us that Clinochlore can be used to enhance cohesiveness in relationships and to heal all levels. The chlorite in the mineral is one of the best healing minerals for the physical, emotional, and mental bodies. It helps one to achieve complete independence, yet allows one to exhibit companion-ability and diplomacy. Simultaneously, it provides a sense of order in one’s life allowing a sense of understanding that you are neither helpless nor hopeless in the creation of personal reality. Michaels Gemstone Dictionary notes that it is an other directed stone that enhances one’s ability to be nurturing, warm, aware of the needs of others and to enjoy seeing that those needs are met. Over the years, I have used Seraphinite to promote regeneration and self-healing. Foremost in its effectiveness is to not fall into the great abyss of nondescriptive intention. In other words, Seraphinite is an effective general healing mineral. It is more effective when you are clear about what needs healed, whether it be a condition, a symptom and a state of mind. As a pendant, it can be worn to bring a state of order to all levels of the body. I suggest doing it in small doses. It is a high or better yet, very strong frequency that can cause the temples (of the head) to ache until the body is able to match resonance with it. Preferably, you would not just keep wearing it as in enduring the pain to speed up the resonance. Speeding up your resonance won’t happen this way. Rather, the pain will increase or you will fall asleep. It is best to remember that minerals are millions of years old and their sense of time does not coincide with our human impatience. Slow is fast, less is more, and small is big are good reminder for working with all crystals, stones, and minerals. For a number of years, people have requested a workshop on building and using shamanic tools. Finally, it has arrived. The workshop will teach how to wire-wrap crystals into jewelry and to make a prayer horn. We will then use our creations in a variety of shamanic ways including journey work. The sacred space will be anchored by an altar of 800-1000 pounds of rocks and crystals. In addition, each person is asked to bring nine (9) pieces of granite that will be used to create individual and intertwining sacred circles. The combination will be to create a massive healing energy to anchor the weekend. Each person will receive an aegerine crystal, a singing quartz crystal, a Chinese bloodstone shield stone, and a piece of kunzite from which to make their personal shamanic jewelry. In addition, everyone will receive an African black andradite and a deer horn tip from which to build a prayer horn. Each person is encouraged to bring whatever stones or crystals that feel appropriate or necessary to support your process. We have limited the number of attendees to 20. The workshop will be held at The Dream Studio, Oregon, WI (10 miles south of Madison). You will receive detailed instructions with your registration. We will begin class at 9 am on each day and end at 2 pm on Sunday afternoon. Cancellations received after August 7 will be subject to a $50 processing fee. Fee: $395 includes a continental breakfast and light lunch all three days, in addition to the above mentioned supplies. Some lodging will be available with participants living in the local area. Otherwise, lodging is on your own. Presenter: Herb "One White Horse Standing" Stevenson (Shawnee and Cherokee) has been exploring indigenous healing practices for over 20 years. He has a private practice in crystal energy healing, specializing in trauma-related work. He provides workshops around the country upon request.